You can configure a PDB snapshot carousel for a specified PDB, create snapshots manually or automatically, and set the maximum number of snapshots. A PDB snapshot carousel is a library of PDB snapshots. You can set the maximum number of PDB snapshots for a PDB. Configure a PDB for automatic snapshots by using the SNAPSHOT MODE EVERY clause when creating or altering a PDB. To create a PDB snapshot manually, specify the SNAPSHOT snapshot_name clause in ALTER PLUGGABLE DATABASE or CREATE PLUGGABLE DATABASE. You can drop a PDB snapshot by running an ALTER PLUGGABLE DATABASE statement with the DROP SNAPSHOT clause. The data dictionary views DBA_PDB_SNAPSHOTS and DBA_PDB_SNAPSHOTFILE show the metadata for PDB snapshots. A PDB snapshot is a point-in-time copy of a PDB. You can create snapshots manually using the SNAPSHOT clause of CREATE PLUGGABLE DATABASE (or ALTER PLUGGABLE DATABASE), or automatically using the EVERY interval clause. Starting in Oracle Database 19c, you can make snapshots of source PDBs in read/write mode. The content of a PDB snapshot depends on the setting of the CLONEDB initialization parameter when the snapshot is created. When CLONEDB is TRUE, the snapshot is a sparse copy of the PDB data files. When CLONEDB is FALSE, the snapshot is a full copy of the PDB files. A PDB snapshot carousel is a useful way of maintaining a library of recent PDB copies for point-in-time recovery and cloning. The carousel for a specific PDB is a circular library of copies for this PDB. The SNAPSHOT MODE clause controls creation of snapshots, and determines whether creation is manual, automatic, or disabled. In a typical development use case, you clone a production PDB for testing. When the CDB is in ARCHIVELOG mode and local undo mode, the source production PDB can be opened in read/write mode and fully functional during the operation. This technique is known as hot cloning. The hot clone is transactionally consistent with the source PDB as of the SCN at the completion of the ALTER PLUGGABLE DATABASE ... OPEN statement. For example, while the production PDB named pdb1_prod is open and in use, you create a refreshable clone named pdb1_test_master. You then configure pdb1_test_master to create automatic snapshots every day. When you need new PDBs for testing, create a full clone of any PDB snapshot, and then create sparse clones using CREATE PLUGGABLE DATABASE ... SNAPSHOT COPY. The following figure shows the creation of the clone pdb1_test_full1 from the PDB snapshot taken on April 5. The figure shows three snapshot copy PDBs created from pdb1_test_full1. 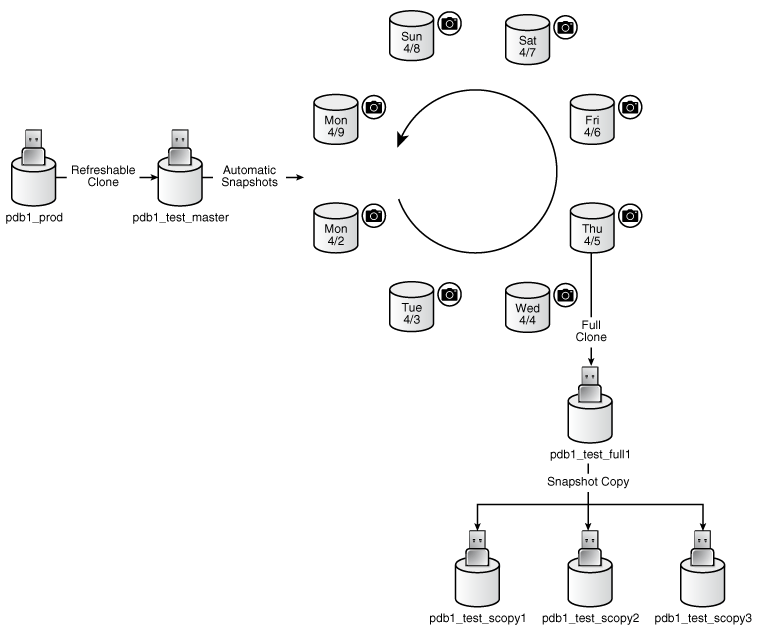 Description of "Figure 16-1 Automatic Snapshots of a Refreshable Clone PDB"
Starting in Oracle Database 19c, when the CLONEDB initialization parameter is TRUE, you can create sparse, database-managed snapshots of a read/write PDB using ALTER PLUGGABLE DATABASE SNAPSHOT. Only the first database-managed PDB snapshot is full. You can clone sparse PDBs from the snapshots by executing CREATE PLUGGABLE DATABASE ... USING SNAPSHOT. Unlike in previous releases, the clone PDBs do not require the source PDB to remain in read/only mode for the lifetime of the clone PDBs. A typical strategy is to take a snapshot of a PDB every day at the same time. Another strategy is to take a PDB snapshot manually before data loads. In either case, a PDB snapshot carousel enables you to restore a PDB using any available PDB snapshot. For example, a sales history PDB named pdb1_prod generates an automatic snapshot every day at 12:01 a.m. On the daily data load on the afternoon of Monday 4/9, you accidentally load the wrong data, corrupting the PDB. You can create a new production PDB based on the Monday 4/9 snapshot, drop the corrupted PDB, and then retry the data load. 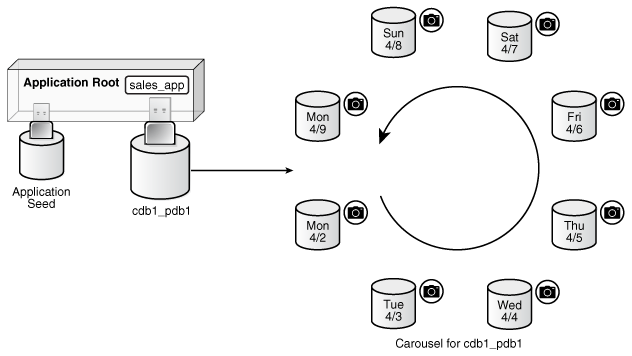 Description of "Figure 16-2 Restore a Production PDB Using a Snapshot"
"About Cloning a PDB or Non-CDB"
The database creates successive copies in the carousel either on demand or automatically. The database overwrites the oldest snapshot when the snapshot limit is reached. The contents of a PDB snapshot depend on the setting of the CLONEDB initialization parameter. The PDB snapshot carousel is the set of all existing snapshots for a PDB. See Oracle Database Licensing Information User Manual for details on which features are supported for different editions and services. Using technologies such as sparseness and copy-on-write, snapshot clone PDBs created when CLONEDB is TRUE behave as full data set copies of a source PDB, without requiring all data to be replicated. Only data file headers are copied. If data blocks in the snapshot clone PDB are modified, then Oracle Database copies the affected blocks, causing the file headers of the source and clone PDBs to diverge. The source PDB headers point to the original data blocks, whereas the clone PDB headers point to the copied data blocks. When CLONEDB is FALSE, data files of the PDB snapshot reside in an archive file on the file system. The archive has the file extension .pdb. No archived redo log files are included. Typically, the archive file is stored in the same directory as the PDB data files. If the snapshot were full instead of sparse, then the full snapshot path would specify an archive with the .pdb suffix. The following figure shows a carousel for cdb1_pdb1. In this example, the database takes a PDB snapshot automatically every day, maintaining a set of 8. After the first 8 snapshots have been created, every new snapshot replaces the oldest snapshot. For example, the Tuesday 4/10 snapshot replaces the Monday 4/2 snapshot; the Wednesday 4/11 snapshot replaces the Tuesday 4/3 snapshot; and so on. 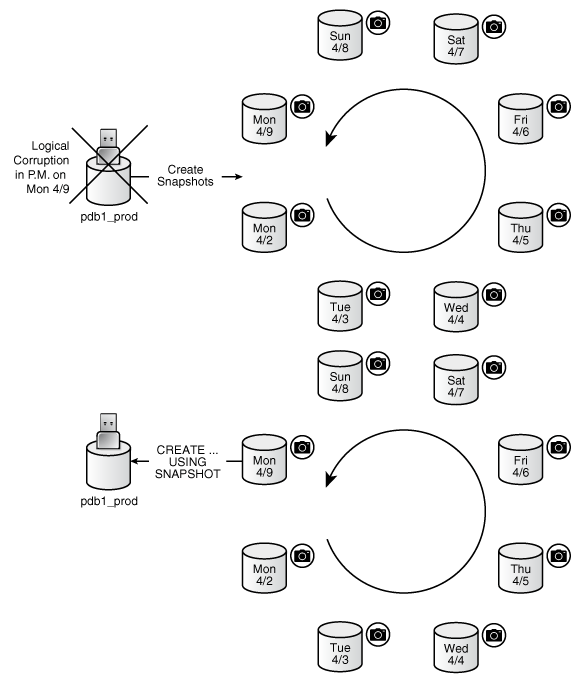 Description of "Figure 16-3 PDB Snapshot Carousel"
Starting Oracle Database 19c, all PDB snapshots in the carousel except the first one can be sparse, and the source PDB can remain in read/write mode. This feature significantly reduces the storage space consumed by the carousel. This clause, which is the default, enables the creation of manual snapshots of the PDB. To create a snapshot on demand, specify the SNAPSHOT snapshot_name clause in an ALTER PLUGGABLE DATABASE or CREATE PLUGGABLE DATABASE statement. The minutes value must be less than 3000. The hours value must be less than 2000. The database assigns each automatic snapshot a system-generated name. Note that manual snapshots are also supported for the PDB when EVERY is specified. This clause disables snapshot creation for the PDB. "About Cloning PDBs from PDB Snapshots"
You can take snapshots of PDBs that are in read/write mode or read-only mode. The first snapshot of the PDB contains full copies of the original PDB files, but subsequent snapshots of the same PDB contain sparse files. You can only take snapshots of read-only PDBs. Every snapshot is a full copy of the source PDB files. In this case, if you create a clone PDB based on a PDB snapshot, then the source PDB must remain read-only for the lifetime of the clone PDB. To set the maximum number of snapshots for a PDB, specify the MAX_PDB_SNAPSHOTS property in ALTER PLUGGABLE DATABASE or CREATE PLUGGABLE DATABASE. The default is for the property is 8, which is also the maximum value. When the maximum allowed number of snapshots has been created, the database purges the oldest snapshot. The CDB_PROPERTIES view shows the setting of MAX_PDB_SNAPSHOTS. The DBA_PDB_SNAPSHOTS view records metadata about PDB snapshots, including snapshot name, creation SCN, creation time, and file name. The DBA_PDB_SNAPSHOTFILE view lists the names and types of the files in a PDB snapshot. This view is only populated when the snapshots are sparse. The DBA_PDBS view has a SNAPSHOT_MODE and SNAPSHOT_INTERVAL column. The MAX_PDB_SNAPSHOTS database property sets the maximum number of snapshots for every PDB in a PDB snapshot carousel. The default maximum is 8. You cannot set the property to a number greater than 8. The PDB must be open in read/write mode. In SQL*Plus, ensure that the current container is the PDB for which you want to set the limit. Optionally, query CDB_PROPERTIES for the current setting of the SET MAX_PDB_SNAPSHOTS property. Run an ALTER PLUGGABLE DATABASE or ALTER DATABASE statement with the SET MAX_PDB_SNAPSHOTS clause. This technique is faster than executing ALTER PLUGGABLE DATABASE ... DROP SNAPSHOT snapshot_name for every snapshot. By default, a PDB is configured for manual snapshots. The CDB must be in local undo mode. The administrator must have the privileges to create a PDB and drop a PDB. In SQL*Plus, log in as an administrator to the PDB whose snapshot mode you intend to configure. Optionally, query DBA_PDBS to determine the current snapshot mode. Run ALTER PLUGGABLE DATABASE with the SNAPSHOT MODE EVERY interval clause, specifying either MINUTES or HOURS. In SQL*Plus, log in as an administrator to the CDB root or application root. Run CREATE PLUGGABLE DATABASE with the SNAPSHOT MODE EVERY interval clause, specifying either MINUTES or HOURS. "Cloning a PDB from a PDB Snapshot: Scenario"
"Configuring a CDB to Use Local Undo Mode"
The DBA must have the privileges to create and drop a PDB. If the source PDB is in read/write mode, then CLONEDB must be set to TRUE, in which case all snapshots except the first one are sparse. In SQL*Plus, log in as an administrator to the PDB whose snapshot you intend to create. Optionally, query DBA_PDBS.SNAPSHOT_MODE to confirm that the snapshot mode is not set to NONE. Run an ALTER PLUGGABLE DATABASE statement with the SNAPSHOT clause. If you do not specify a PDB snapshot name, then the database generates a unique name. Note that the snapshot paths in the preceding example are .pdb archives, which means that snapshots are full rather than sparse. To drop all PDB snapshots based on a PDB, set the MAX_PDB_SNAPSHOTS property in the PDB to 0 (zero). In SQL*Plus, ensure that the current container is the PDB from which you created the PDB snapshot. Run an ALTER PLUGGABLE DATABASE statement with the DROP SNAPSHOT clause. DBA_PDB_SNAPSHOTS contains general information about the snapshot, including name, SCN, time, and path. DBA_PDB_SNAPSHOTFILE shows the path and file type of every file in a snapshot: data files, archived redo log files, and XML files. DBA_PDB_SNAPSHOTFILE only shows sparse clone PDBs. To create sparse clones, the CLONEDB initialization parameter must be set to TRUE. In SQL*Plus, log in to the database as an administrative user. The following query shows two PDB snapshots. The snapshots are full, not sparse, as indicated by the .pdb extension.